Finally somebody leaks me a poll! 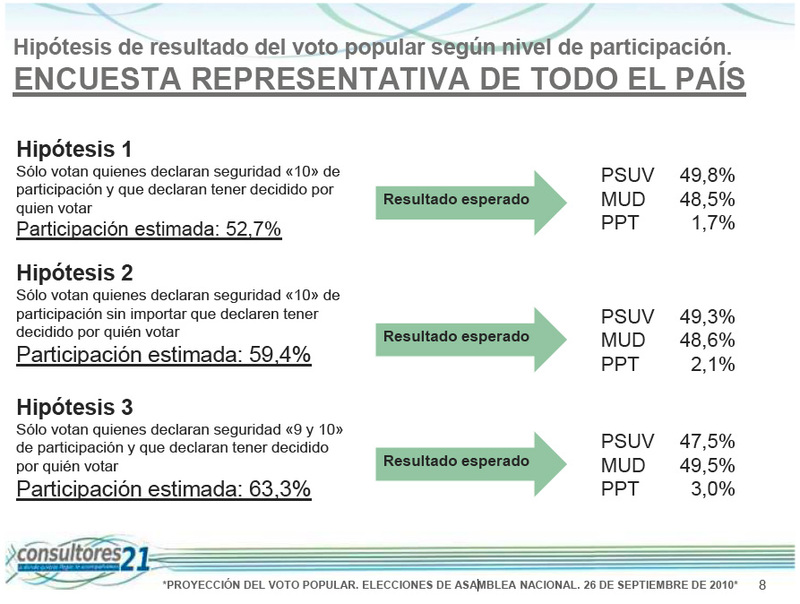 Consultores 21 thinks the popular vote will be very close. They surveyed 2000 people between August 20th and September 7th. The results, as we know, depend on the turnout. Contrary to what I’ve guessed, though, they think higher turnout is better for us. In their high-turnout scenario, the opposition is ahead of PSUV by about 2 percentage points 49.5% to 47.5%, with PPT picking up 3% nationwide. This suggests an opposition haul of 70-75 seats, according to my Forecasting Tool. In other words, it would leave Chávez with a comfortable majority in the Assembly. I dunno you, but I’d take that result any day! Their less optimistic, low-turnout scenario would leave us somewhere around 61-66 seats. Download the slides (in Español) here. UPDATE: I should make clear that the Seat estimates are not C21’s, they’re mine. (What you get from plugging these numbers into the Forecasting Tool.) C21 is not releasing seat estimates. Previous articleMessage Discipline: We’ve Finally Got Some!